Louisville Mindfulness Center is now open to the public in Louisville, KY. Megan Bayles Bartley, who was named one of Louisville's Top 3 Family & Marriage Therapists, is now accepting new patients. (PRLEAP.COM) Louisville, KY - July 28, 2017 - Megan Bayles Bartley, a well-known marriage and family therapist in Louisville, KY, is excited to announce that she has expanded her counseling practice by opening the region's first mindfulness center. After seeing an increase in demand for her therapeutic and meditation services, Megan hired two additional therapists to join her practice and to help establish the Louisville Mindfulness Center. The Louisville Mindfulness Center's mission is to help participants find peace and joy within themselves, as well as in their relationships with others, through therapy, coaching, and classes. Megan, and her new team of therapists, plans to provide the necessary mental tools available to clients, so that they can more effectively deal with life's stressors in a practical manner. Megan is making it easier to access therapeutic services incorporating a different view of mindfulness in the city of Louisville, KY. She hopes that by doing this individuals will be able to decrease their levels of anxiety, irritability, anger, depression, and fear, in a natural, effective, long-term manner. All of the coping skills taught by Megan and her team are designed to calm a person's body and rewire a person's brain to think in more peaceful and joyful terms. In addition to offering one-on-one sessions, group classes, and one-hour mindfulness meditations, the Louisville Mindfulness Center also collaborates with other local therapeutic businesses to bring classes and training sessions to the public. Currently, the Louisville Mindfulness Center is offering Summer Mindfulness Meditations for a special rate of $25 a class. 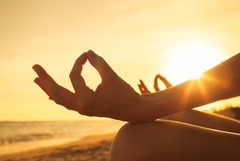 The next 1-hour Summer Mindfulness Meditation is on August 9th from 5:30 - 6:30 p.m.
Additionally, on August 31st at 6 p.m., the Louisville Mindfulness Center will provide a speaker session on "Training the Brain" at the Louisville Salt Cave. Research on salt caves and salt therapy, also called "halotherapy," shows that the immune system can truly benefit from meditative sessions in a room that is infused with salt air. Salt air can also help improve respiratory, dermatological, and mental health issues. Join Megan as she closes out Louisville Salt Cave's August Speaker Series and offers helpful bits of wisdom and an experiential practice that can calm mind, body, and soul. You can register online for this mindfulness-centered class by emailing louisvillemindfulnesscenter@gmail.com today. Two like-minded therapists have joined Megan Bayles Bartley at the Louisville Mindfulness Center - Stewart Morgan and Maggie Cox. Both Stewart and Maggie are currently accepting new clients. Stewart is a Marriage and Family Therapy Associate who also has a Master's degree in Art Therapy. Stewart enjoys helping clients come up with solutions to personal issues through creativity. Stewart spent his childhood growing up in Bangladesh, India, and has a talent working with clients who have different cultural backgrounds and views. Maggie is also a Marriage and Family Therapy Associate who works with couples, individuals, teens, and families. One of her specialty areas includes working with teenage girls and families who are struggling with alcohol misuse and addiction. Maggie is a Louisville, KY, native who has spent time travelling across the United States and living in the Pacific Northwest. Megan describes herself as an open-minded, supportive, direct, and balanced therapist who applies mindfulness and meditation to a lot of her practice. After growing up in Seattle, WA and graduating from the University of Washington, Megan went on to get her Master of Arts in Marriage and Family Therapy from the Louisville Presbyterian Theological Seminary. Since graduating, she has offered therapeutic services focusing on anger management, marriage & couples counseling, as well as ways to help end a relationship or cope with resistance to change, to individuals and groups in Austin, TX and Louisville, KY. When not offering therapeutic services at the Louisville Mindfulness Center, Megan contributes to the media including Today's Woman magazine and public speaking events. She truly enjoys speaking to the parents of children at Sacred Heart on stress management and mindfulness. She is also a board member of GLOW - Greater Louisville Outstanding Women - which connects and supports female business owners and leaders in the Louisville area. In her free time, she enjoys spending time with her family, reading, practicing yoga, and harnessing her creativity. 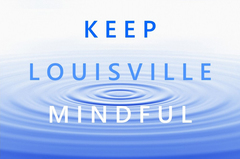 If you are looking for a therapist in the Louisville, KY-area who incorporates mindfulness into their practice - contact Louisville Mindfulness Center today. 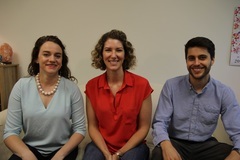 Megan, Stewart, and Maggie all have open appointment slots available for new or returning clients. You can register for an appointment online by clicking here. 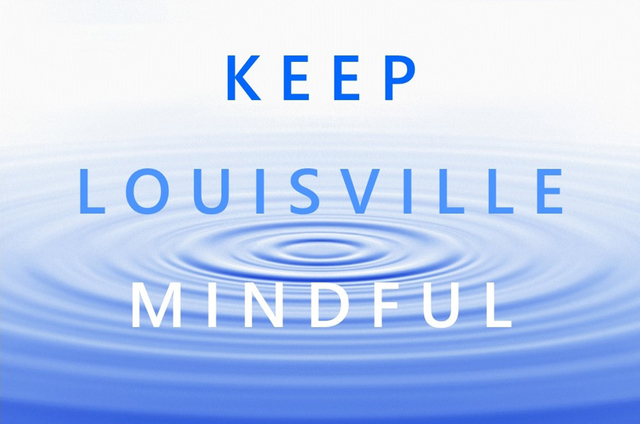 If you have questions about the services offered at the Louisville Mindfulness Center or are interested in a free 10 minute consultation call 502-509-9307 or email louisvillemindfulnesscenter@gmail.com today.